The climb down was trickier, as it was getting dark very quickly. By the time we got out of the temple premises, it was pretty dark. We made our way to the shops outside the temple, and were duly greeted by another "Leddy, you buy from me?" bunch of locals selling everything from drinks to necklaces to silk tops. Needless to say, we swarmed towards the drinks shop first. We ordered coconut water, and boy, were the coconuts huge! I may have a photograph to show, in one of the later days' account. Then the "leddy" made her way towards the shop selling the silk tops. I immediately found something I liked, but I wasn't sure if it would fit. It looked tiny, and they did not have a bigger size. Seeing my apprehension, the gracious shop lady let me try it on, over my sweaty T-shirt! It was a perfect fit! And for a moment, there I was, trying on a pretty pink top, and delighting in the fact that 'small' size fitted me! We took a tuk tuk (hey, that sounds funny -- took a tuk tuk!) back to the hotel, showered and changed. And carried out the first of our downloading ceremonies, which were soon to become a regular feature of our holiday. Ro carries his laptop everywhere! At first, I could not believe that he had actually taken his laptop with him on a holiday! But it turns out, that was one of the best things to happen to us! I owe a big part of what Hopscotch is today, to Ro and his laptop. If I hadn’t been able to download all the photos I took every single night, there wouldn’t have been so many crazy snaps, there wouldn’t have been the spontaneity, there wouldn’t have been the moments to remember. Hopscotch would have looked different. We would be smiling in all the photos. Always smiling. Always posed. Uninspiring. After the ceremony, we decided to go to the Psar Chaa ('old market') area, the most happening place in Siem Reap. 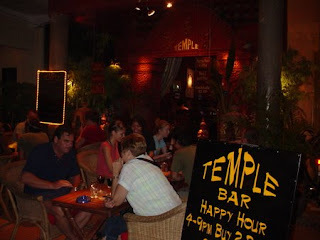 We walked around the place, checking out the eating places and the bars, and the guys finally decided on Temple Bar, because it was 8:55 and they hoped to make it for happy hour. Check out their happy hour timings! We chose a cosy corner near the balcony upstairs. The waiter told us that we could still make use of happy hour. At the stroke of 8:59, we finished placing our orders. I ordered a Pina colada, the first alcoholic drink of my life that I actually managed to finish by myself. 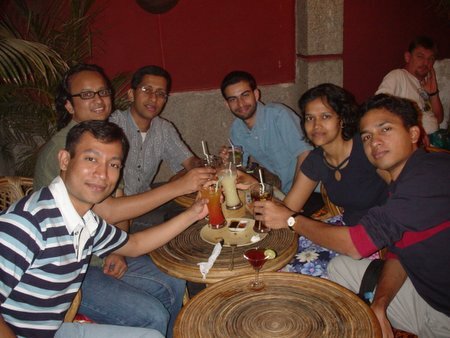 Though I had tasted alcohol before, I had never liked it. But I really liked my drink that day. As we sat there and had dinner and sipped our drinks, I realised something. There I was, sitting at a bar in Cambodia with five guys, and drinking on a Friday night. And it didn't feel odd at all. Hell, I was one of them. Which one of the five guys do you not consider one?